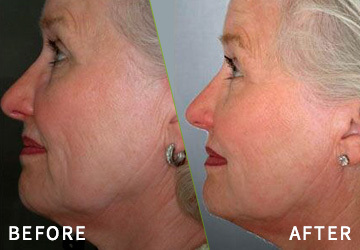 We offer laser rejuvenation treatments combined with LED therapy to promote wrinkle reduction. These combination treatments recharge the skin, boost the skin’s anti-aging abilities and help enhance the skin’s own natural repair process providing a prolonged youthful appearance. Traditional skin rejuvenation treatments include topical creams, dermal abrasion, chemical peels and ablative lasers such as the CO2 and ER: Yag ablative lasers. These are effective in reducing wrinkles from aging or photo damage, but result in side effects that are painful and require significant recovery time. While remodelling of the dermis is required for effective skin resurfacing, these ablative treatments also destroy the epidermis to some extent. Several layers of the skin are removed during treatment, and the affected areas are often left with open wounds. Common side effects include erythema, scarring, pain and infection and further sun damage if clients do not adhere strictly to aftercare instructions. Consequently, these treatments can require several weeks of patient recovery time. The introduction of non-ablative (non-invasive treatment with Gentlemax™) lasers has made it possible for patients to seek treatment with little interruption to their work or social schedules. Non-ablative lasers selectively target the dermis, while protecting the epidermis from injury. This selective remodelling of the dermis is responsible for the improvement in skin appearance with minimal post procedural side effects. Non-ablative laser rejuvenation treatments, combined with LED therapy, are able to provide a more immediate result than most anti-aging creams and facials that only manage to penetrate the skin’s surface. Our laser rejuvenation treatments have the advantage of working at cellular level to stimulate the body’s own collagen and elastin formation and restore the skin’s function. As the collagen layer thickens, skin tone and elasticity improve, resulting in wrinkle reduction. However better results have been achieved in cases where laser is used in conjunction with a suitable skincare regime and a healthy diet and lifestyle. How does laser rejuvenation and wrinkle reduction work? The Gentlemax™ produces a fine laser beam in the form of thermal (heat) energy, which gently warms the deeper layers of the skin that activate fibroblast cells to produce new collagen growth and stimulate cell renewal, whilst accelerating the microcirculation of blood vessels which enhance elastic fibres. Collagen is the foundation of your skin and as the collagen layer thickens, skin tone and elasticity will improve leading to a firmer, more youthful and healthier appearance with the added bonus of softer fine lines and wrinkles. The production of collagen continues over the next few weeks following your treatment. Postpone aging by optimizing the two-vital networks responsible for the skin’s youthful appearance. In general, excellent results can be achieved surpassing those associated with external applications of cosmetic anti-aging preparations. Clients have no down time and everything to gain by starting treatments now and achieving clear, rejuvenated, younger looking skin. Take the plunge…………….. All you have to lose is a few years!!! Collagen, elastin (both proteins) and hyaluronic acid (which gives skin volume) decreases as skin ages. There is a decline in the number of collagen fibres and an increase in thickness of these fibres due to cross linking. These changes result in a decreased ability for the skin to retain water and the rearrangement of fibres contributing to wrinkle formation. Aged skin is usually dry, dehydrated and lacks elasticity commonly as a result of harmful UVA and UVB rays in sunlight that produce enzymes that break down the skin’s supportive structure and so prevent formation of new collagen. There are three phases which comprise aged skin: development phase, mature phase and senescence phase. There are two main processes of skin ageing: intrinsic and extrinsic. Intrinsic ageing is involuntary and reflects the genetic background of the person and is therefore inevitable, whereas extrinsic ageing is caused by external factors such as sun exposure, poor nutrition, smoking and alcohol among others which we can control. Essentially, extrinsic ageing is the ageing we experience due to environmental factors with a major factor being the sun. There are numerous signs of photo-aging that are essentially related to skin colour and more importantly a person’s exposure to sun. Ageing is apparent in one’s skin through the manifestations of telangiectasia, skin wrinkling, leather-like dry skin, lentigenosis and hyperpigmentation. Collagen in the dermis becomes calcified, with a loss of bonding strength between the epidermis and the dermis leading to deep lines, furrows and wrinkling of the superficial skin. There are two types of wrinkles, Dynamic wrinkles which occur when we form facial expressions and Static wrinkles which are present when the face is at rest. Overall, exposure to ultraviolet (UVA or UVB) radiation from sunlight accounts for about 90% of the symptoms of premature skin ageing, and most of these effects occur by age 20. Effectively protecting the skin from sun damage is one of the most important ways to reduce wrinkles and prevent skin cancer.